Ansonia Clock Co. hanging gallery clock, called, "Cable", ca 1904. Made in 4 sizes this is the middle size with a 6 inch dial. 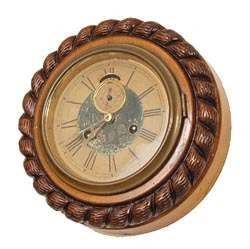 Made of black walnut with a twisted "Cable" or rope effect around the outer edge. Lever movement is 8 day, double wind, seconds dial and running just fine. I first thought there was some old advertising in the center, but now I am not sure what it is. Full backboard label is pretty nice considering the age. Ly-Ansonia No. 707.